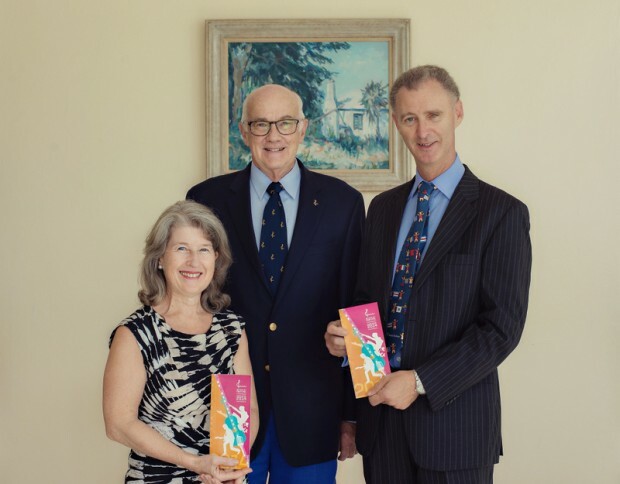 Ticket brochures for the 2014 Bermuda Festival of the Performing Arts have gone into circulation with Chairman Ian Davidson presenting the ticket brochure to Joint Honorary Patrons the Governor Mr. George Fergusson and Mrs. Fergusson who will be the first dignitaries in that position to actually perform in the Festival themselves. They will sing with Bermuda Chamber Choir in the first of a series organ recitals. “Hip YouTube sensation Pentatonix opens the Festival with a lively vibe on January 16 and a retro Beatles Tribute Band brings it to a close at the end of February, with a broad menu of delights sandwiched in between” a spokesperson said. “There is a Eugene O’Neill play directed by Bermudian Timothy Trimingham Lee; Film star Julian Sands plays in a one-man tribute to playwright Harold Pinter; there’s a Festival-within-a Festival of organ music; there’s ballet and flamenco; a songstress; an Irish fiddler; brass and string ensembles; local jazz artists will be performing and there will be delightful rendition of Julia Donaldson’s tale of The Snail and the Whale for the very young. “A ticket brochure has been sent to every household for all to review the programme and there are just a couple more weeks before tickets go on sale. More information will be released shortly, but please note that there has had to be a date change for two of the artists since the brochure was printed.” The correct dates appear below. Vocal sensations and winners of NBC’s The Sing-Off, Pentatonix are taking instrument-free music far beyond anyone’s wildest expectations. For a taste of what to expect check out their Evolution of Music video on YouTube. Fresh from her Broadway role in Fela! stunning vocalist Melanie Marshall comes to Bermuda to present an evening of song in a widely varied programme with something to suit all tastes. The programme will be parcelled up with lively banter from the artist, whose sparkling personality permeates all she does. Cassa Pancho’s Ballet Black highlights and celebrates the talents of black and Asian dancers from around the world. The Company is presenting a mixed bill including Ballet Black’s newest story ballet, War Letters, an episodic journey through relationships built during World War Two. The collaboration of fiddler Martin Hayes, regarded as one of the most extraordinary talents to emerge in the world of Irish traditional music and Dennis Cahill, master guitarist with origins from County Kerry, Ireland is acknowledged as a major breakthrough for guitar in the Irish tradition. The first of our Festival-within-a-Festival organ recitals! Lloyd Matthew will be the featured organist and will be joined by the Bermuda Chamber Choir. Nobel Prize-winning playwright Eugene O’Neill’s Pulitzer Prize-winning masterpiece Long Day’s Journey into Night comes to Bermuda directed by Bermudian Timothy Trimingham Lee with a British and American cast and creative team. Celebrated organist John Scott, Organist and Director of Music at St. Thomas’ Church, Fifth Avenue, New York and former Organist and Director of Music of St Paul’s Cathedral, London will perform the second recital in the series. The hit musical adaptation of the award-winning picture book by Julia Donaldson and Axel Scheffler performed by Tall Stories. Storytelling, live music and lots of laughs, in a show for everyone aged 4 and up. The Borromeo has grasped the digital age replacing the sheet music of old, with laptop computers. The scores will be projected on a screen above the Quartet, vividly illustrating the creative process and enhancing the audience experience. Organist Robert Smith (known to locals as a member of Voces8) pairs up with flautist Ruth Stockdale as duo INVERSION, demonstrating the delightful combination of flute and organ, in the 3rd recital in the series. Hailed by critics everywhere for its transcendent and deeply emotional performances, Noche Flamenca is recognized as one of the most authentic flamenco touring companies in the field today: dance, song, and music – the very heart and soul of flamenco. Directed by John Malkovich, his co-star in the acclaimed film The Killing Fields, actor Julian Sands paints a vivid picture of the life of Nobel Prize-winning British playwright Harold Pinter in this one-man show. Fresh from their recital in New York, organ duo Max Kenworthy and Nicholas Grigsby perform a thrilling programme of well-known and popular works, playing together on the organ at St.Paul’s Paget. The broad depth of Bermuda’s talent is celebrated in tonight’s concert featuring Tony Bari and Friends. Tony will be joined by musicians Ronnie Lopes, Stan Gilbert, Conrad Roach, Earl Leader, Denton Leader, Denis Francis, Derek Simmons, Jade Minors and vocalists Gita Blakeney Saltus and Sheila Smith. Onyx Brass is a leading light in establishing the brass quintet as a medium for serious chamber music. Renowned for being utterly accessible to audiences their lively programmes are presented in an entertaining and articulate fashion and will include a short appearance by local workshop participants. Grab a Ticket To Ride on a colourful journey back in time, in this Complete Tribute to the Beatles, as the musicians of American English capture the very essence of John, Paul, George and Ringo. Visit the Bermuda Festival website for more information.